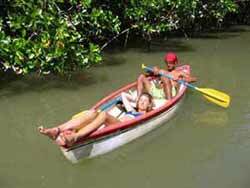 The Mangrove Paddling & Fishing Experience is more than a fishing trip, its an amazing natural adventure. The dramatic setting is the intensely beautiful Isla Damas Mangrove Sanctuary, an area specifically protected within Costa Rica's Constitution. There are monkeys roaming freely, exotic tropical birds, reptiles and much more endangered wildlife in this most Tarzanesque of natural environs. The guides are locally-born and are qualified experts at spotting the flora and fauna. They have spent their entire young lives fishing the mangroves and are allowed to keep the pathways and tunnels open with the government's permission. The quietness of paddling lets the jungle orchestra play its most magnificent songs for you. The first order of the day is to gather bait by casting a net in search for shrimp, small crabs and small fish. Usually the cast netting is very productive. When the casting is less abundant other fun measures are called for, including catching small crabs by hand that line the shore's mangrove roots. The bait-gathering adventure winds down while you enjoy a cold drink on the water's edge and the guides get the boat squared away to await the exact tidal change. Lightweight aluminum paddles are used. The boat will be a typical panga used by local fishermen that the young guides often insist is easier to paddle stern-first. You will paddle along the gentle waters to the best fishing spot where a delightful picnic lunch will be served aboard the panga. The fishing (which as you will soon learn is somewhat incidental to the rest of the experience) starts by breaking out the hand spools and learning to throw a hand line. You will fish the day away like the locals do. Once the fishing is over, you may want to paddle over to a simple, tiny restaurant on the water's edge for parting drinks (not included in the price). The charming owner, Jimmy, will lovingly cook your catch in front of your eyes. If you wish to see where and how the guides live, another optional part of the trip is a visit to one of their homes. The family will be pleased to meet you. This tour is highly recommended by PuertoQuepos.com and is not to be missed. Transportation and all fishing supplies are included. The exact pick-up time depends on the ocean tides. Your Costa Rican guides are Spanish-speaking (non-bilingual) and communicating with them is a true joy. This is the perfect non-tourist option for adventurers seeking an authentic Costa Rican experience. Groups sizes start at two guests with a maximum of six. Check Availability.